With the increasing popularity of e-commerce, engaging your online customers is crucial. User-generated content, such as reviews and ratings, and quality product descriptions increase your search engine rankings, drive traffic to your site, and improve conversion rates. Strategic, unique content is what sets you apart in the crowded world of e-commerce. As customers become more comfortable with online shopping, their expectations grow. They seek a lot of information before making a purchase decision. Providing well-planned, well-written content empowers them to make informed and satisfying decisions. When the customer is impressed with your innovative and helpful content, such as product specifications and buying guides, your reward is a higher customer rating and better search engine rankings. Dissatisfied customers are likely to move on and develop brand loyalty to your competitors. What Happens When Product Content is Not Appropriate? E-Commerce product descriptions have a significant impact on shopping habits. When the benefits and features of the product are accurate, detailed and helpful, customers are better able to make informed decisions and form a purchasing habit with your company. With poor product descriptions, your customers will still form a purchasing habit, but it will more likely be with your competitor. Inappropriate product descriptions and images will create dissatisfied customers and negatively affect brand loyalty. If customers are unclear about a product’s attributes, they are less likely to spend their money. When this happens, any chance of building a positive connection with that customer is lost. When customers don’t have a clear idea of what they’re going to receive because of poor product specifications, they are more likely to be disappointed with their purchase and return their goods. This is particularly true for the apparel industry. Each returned item costs your business, both in restocking and customer service follow-up, and in lost customer loyalty. Search engines require detailed product descriptions to rank your e-commerce site highly. With vague or incomplete product content, you lower the chances of organic search traffic ever reaching your site. Properly structured content includes accurate and complete product descriptions that boost your search engine ranking and, in turn, your sales. Content that is off-brand confuses customers trying to connect with your company. Branding develops a set of expectations for how you interact with customers and if your content fails to meet those expectations, your brand capital erodes as customers lose trust in you. These customers are unlikely to make repeat purchases and lost trust is very difficult to regain. Your content must project your brand accurately in its tone, its format and its imagery. A clean, easy-to-use interface with complementary content make the conversion from viewer to customer seamless. Any disruption in this flow of information, such as inconsistent product descriptions or images, inaccurate information or a confusing interface, delays purchasing. Only when customers have confidence in your information will they feel satisfied and convert to loyal brand followers. As a retailer, you face several challenges in creating your own high-quality e-commerce product descriptions. For example, a lack of resources, inefficient tools, a lack of up-to-date SEO skills, confusing workflows and poor data all make it more difficult to manage and publish excellent content. 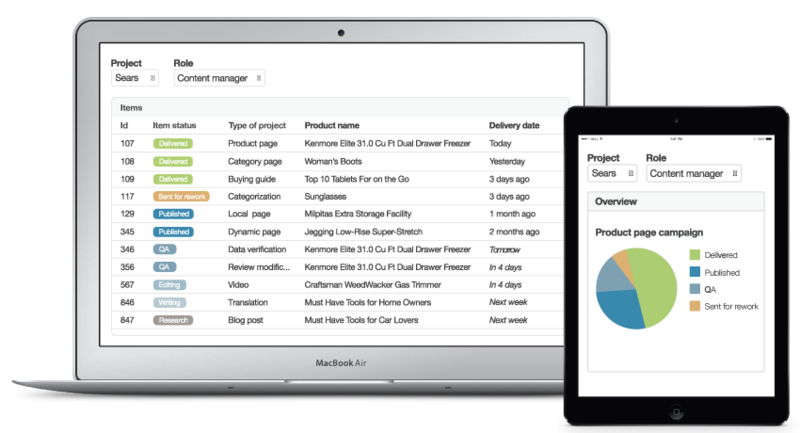 CrewMachine enriches your product information by identifying gaps in your SEO strategy and streamlining the workflow to update your catalog. Our content and management teams have SEO expertise, an understanding of customer habits and the ability to communicate your brand. The result is a higher conversion rate, a more pleasurable shopping experience and increased sales.